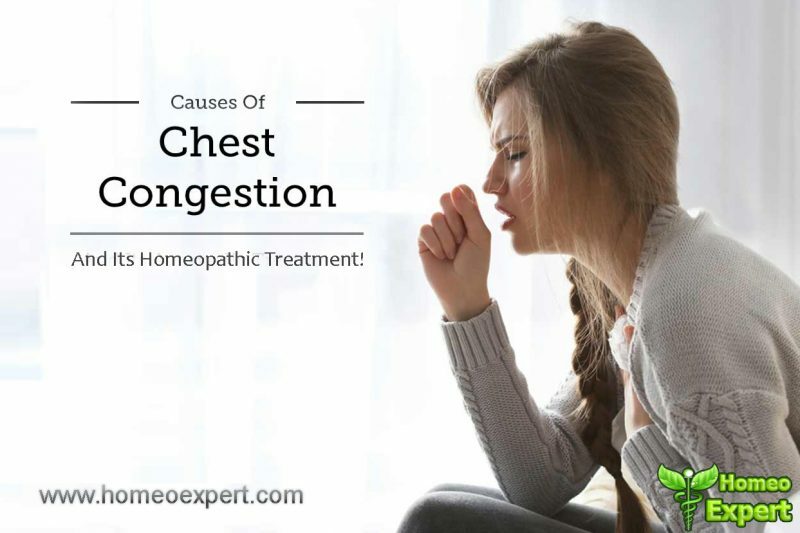 In this post of Homeo Expert, we shall discuss thebest homeopathic treatment or best Homeopathic medicine for Chest Congestion or Homeopathy for Chest Congestion. First of all, you need to know that chest congestion is not a disease but we refer to this term as a collective symptoms. These symptoms can occur in your respiratory diseases. It includes the sound of rattling along with cough and it occurs due to the gathering of mucus in the chest. Additionally, the whisteling sound can produce during breathing, difficulty in ejecting the phlegm or mucus gathering in the lungs, chest pains, suffocating spells and difficulty in breathing. Bronchitis, Asthma and Pneumonia are few respioratory diseases that help the chest congestion to develop. If you do not treat a simple cold, it will lead you to chest congestion because of the spread of infection. Read this article to get the possible homeopathic remedies for chest congestion. We rank Homeopathic medicine Antimonium Tart as one of the best homeopathic medicines for chest congestion. Chest congestion with an excessive rattling of mucus in the lungs on coughing indicates that the patient needs Antimonim Tart. The lungs seem to be full of mucus and even on coughing the patient ejects very little mucus. in this medicine, the patient feels difficulty in breathing and he takes a short breath instead of normal breathing. Additionally, the patient feels suffocation and it forces him to sit up. If the chest congestion occurs due to working in damp basements, Antimonium is the best homeopathic medicine for this patient. We also prescribe this medicine to those babies who face difficulty in respiration after birth. Arsenicum Album is another homeopathic medicine for chest congestion which helps us to cure the chest congestion. It is suitable for those patients of chest congestion who feel suffocation at night time. The patient of this medicine feels suffocation with difficulty in breathing and it becomes worse when he lies down and better by sitting up. When the patient breathes the whistling and wheezing sounds are produced. The symptom of cough becomes better by having warm drinks and the symptom of burning pain in the chest is also notable. It is also helpful in Homeopathic treatment for chest congestion in those cases where the patient feels it after having cold drinks. Ipecac is a valuable and natural homeopathic remedy that gives outstanding results when the patient has the symptom of wheezing in the chest. The patient has a continuous violent cough and the chest is full of mucus but despite coughing nothing comes out. There is a suffocation with compressing feeling in the chest. The face of the patient seems to be bluish due to an insufficient amount of oxygen which results in suffocation or suffocative spells. When the patient ejects mucus and sometimes it comes with blood. Persistent nausea is present along with cough and chest congestion. If the patient vomits, it gives relief to him. Phosphorus is one of the best homeopathic medicines for the treatment of chest congestion with chest pain. The pain comes with a burning in the chest and the patient has constrictive and oppressed feeling like he feels that he has a weight on his chest. In Phosphorus, the cold air gives rise to the symptoms of chest pain and cough and it also becomes worse by laughing and talking. The patient also crave for cold drinks, juice and ice creams. Bryonia Alba gives relief to the patient of chest congestion and the symptom of cough along with difficult breathing is an indication of this medicine. The patient of Bryonia feels difficulty in breathing and it becomes worse with a slight motion and gets better by rest. In Bryonia Alba, the symptom of cough gets worse after drinking, eating and in a warm room. It has a powerful effect when the patient feels stitching pain in the chest during respiration. The pain in the chest becomes worse while coughing and the patient holds his chest with hands due to the severe pain in the chest while coughing. The ejected mucus is thick in nature and it comes out by after hawking and he also feels increased thirst for water. We recommend this medicine for elderly people who suffer from chest congestion. The patient of Senega also complains of rattling of mucus in the chest along with oppressed feeling. It takes a lot of effort to expectorate the mucus and it is tough and abundant in nature. The patient also feels extreme soreness in the chest. Both Antimonium Tart and Hepar Sulph are natural homeopathic medicines for chest congestion with symptoms of rattling of mucus in the chest. We suggest Antimonium Tart to those patients who have rattling of mucus in the chest while coughing. The symptoms of this medicine increase when the patient goes into dampness. When the patient feels rattling of mucus and it becomes worse in the morning, Hepar Sulph is the second homeopathy treatment for chest congestion. The patient cannot bear the cold air. Ipecac is a natural remedy for chest congestion when the symptom of wheezing is present due to chest congestion. The patient of this medicine gets relief after vomiting or coughing out the mucus. we use Nux Vomica when the symptom of wheezing becomes worse during sleep. Arsenicum Album is a useful medicine when the suffocative spells are present along with wheezing and cough. The symptoms of the patient decrease after having warm drinks. Bryonia Alba is a natural homeopathic medicine for chest congestion and it is recommended to give relieve the patient from difficult breathing. This medicine can be used when the motion gives rise to the problem and the patient gets better when he takes rest. Again, Arsenicum Album is useful when the breathing becomes worse on lying down and get better by sitting up. Lachesis is an effective homeopathic medicine which is useful in treating suffocative attacks and they get worse on lying down. The patient goes to an open window to get relief and he takes deep breaths. He does not tolerate anything around his neck or waist. In Homeopathy for Chest congestion, we prescribe Sambucus when the patient gets suffocation during sleep and the patient wakes up suddenly almost like a breathless. It is suggested in infants and young children. Both natural homeopathic remedies are helpful in homeopathy for the treatment of chest pain that occurs due to chest congestion. But we select the remedy according to the symptom of the patient. The patient of Bryonia feels stitching type of pain and gets relieved on lying down. We suggest Phosphorus when the symptoms of chest pain become worse on lying down on the left side and by pressure. Warm applications reduce the pain and cold air worsen the chest pain. Kali Sulph is one of the best homeopathic remedies for congestion; It is suitable when the mucus rattles in the chest and is ejected with much difficulty. The ejected mucus is yellow in color. If we talk about color Pulsatilla is helpful when the mucus from the chest is greenish in color and it also comes out with difficulty. Kali Bichrome is a helpful medicine when the mucus is extremely thick and stick in nature. It comes out of the mouth like a string and needs force to spit it out. When the symptoms come suddenly after exposure to cold air, Homeopathic medicine Aconite is useful. The patient takes short breath and labored breathing is also present. In Aconite, the symptom of anxiety and restlessness is also present with chest congestion. Natrum Sulph is a holistic medicine for chest congestion when occurs in damp weather. The patient of this medicine needs to take deep breaths because he feels rattling of mucus in the chest with difficulty in breathing. This medicine also forces the patient to hold his chest during coughing and the color of the mucus is green in color. These medicines are an effective homeopathic medicine for chest infection or chest cold in infants. The child has the symptom of continuous rattling cough and his face turn into blue due to incessant coughing. Wheezing from the chest is intense and vomiting relieves cough. Sambucus is another Homeopathic medicine for Chest Congestion which is helpful when an infant faces cough attacks at night along with blockage of nose. The infant wakes up at night with sudden crying. Chamomilla is another homeopathic medicine for infants who suffer from rattling cough with severe irritation and crying. When someone carries around the infant, he feels better.